ULTRALIGHT FR SHIRT: This is an advanced ultralightweight FR shirt. 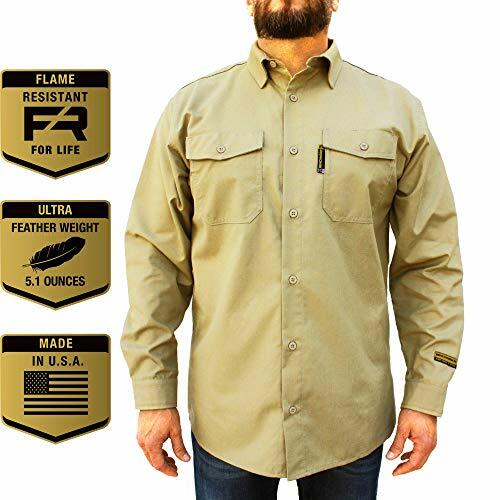 Traditionally flame resistant shirts and FR clothing have been heavy and uncomfortable to wear, 7 ounce fabrics are not thin. We created the Silver Bullet flame resistant shirt to be the lightest and most comfortable FR shirt, to achieve a CAT 2, ATPV = 9 cal and be UL certified to NFPA 2112. At only 5.1 ounces, you will not find a lighter FR shirt that provides the same level of protection. BREATHABLE AND EXTREME MOISTURE WICKING: No one wants to wear fire resistant shirts that gets sweaty and stay sweaty throughout the day, so we designed the Silver Bullet FR shirt to have extreme moisture management capabilities. The grid structure of the fabric allows the shirt to breathe and wick away moisture as well as traditional athletic base layer shirts. COMFORTABLE & STRONG FR CLOTHING FOR MEN: The core of our fabric is a grid structure made of the ballistic materials kevlar and ballistic nylon surrounded by other inherently FR materials. This grid provides superior mechanical strength, drape and flexibility. The Silver Bullet FR shirt is so durable, that it outlasts the competition by a factor of two. It also has less than 1% shrinkage in the wash and will not fade like other shirts. INHERENT FIRE RETARDANT PROPERTIES: The multihazard arc and flame resistant properties will not change regardless of the number of wash and wear cycles. The Silver Bullet FR shirt is lightweight and comfortable, it also provides HRC/CAT Level 2 protection with a 9 cal sq/cm rating with NFPA 2112 certification. Meets or exceeds NFPA 70E compliant and ASTM F1506 standards. It is safe to wear against your skin and you can wash it at home or at the industrial laundry. MADE IN THE USA: We make all our Silver Bullet FR shirts in the U.S.A. We are a 16 year old family owner manufacturer, this allows us to maintain the highest levels of quality and control from start to finish. Each Silver Bullet flame and arc flash-resistant shirt has its own serial number. This advanced FRC blend FR Viscose, Aramids, Nylon-66 and antistatic fibers is unlike any other piece of FR clothing you have worn. If you have any questions about this product by Benchmark FR, contact us by completing and submitting the form below. If you are looking for a specif part number, please include it with your message.